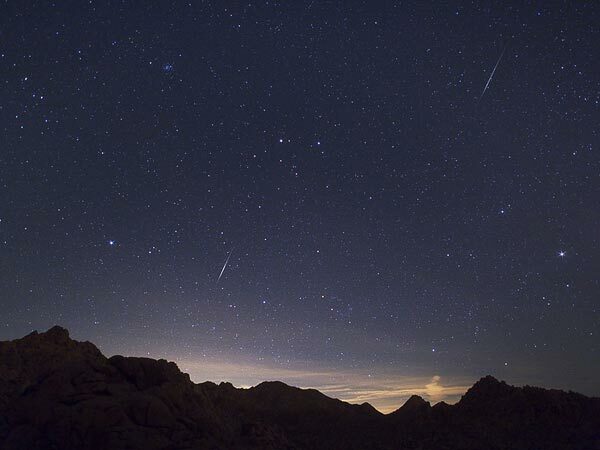 2012 Quadrantid meteors over the Mojave Desert (Credits: Wally Pacholka/TWAN). The first meteor shower of 2013 is expected to peak late January 2nd into early January 3rd. A near-full Moon may mask the vibrancy of the show, which as usual will be intense and shortlived, with a peak rate of 120 meteors per hour. The Quandrantids shower is named after a former constellation from which the meteors appeared to stem, the Quadrans Muralis. The International Astronomical Union discontinued the Quadrans Muralis, splitting up its stars between the Bootes and Draco constellations.The meteors are thought to derive from the lost comet C/1490 Y1. Best viewing will be from the northern hemisphere, but those who don’t have a good view from home can follow along on NASA’s live feed.